“Sometimes dead is better.” Unless you’re back from the dead with a vengeance! Brace yourself for the spine-chilling, immensely terrifying 2019 adaptation of the best-selling novel Pet Sematary by the legendary Stephen King. Whereas many remakes/reboots of earlier horror films often suffer, this one emerges from the soured soil as a force to be reckoned with. Directors Kevin Kolsch and Dennis Widmyer deliver a heartpounding rollercoaster of a nightmarish experience as Pet Sematary opens everywhere this weekend. Instead of a direct from page to screen adaptation, much like the fantastic 1989 original version (and yes, it still holds up), this version takes some creative liberties; however, the soul of the novel and even the 1989 version is clearly there. This creative latitude enabled the film to deliver new, surprising scares that are sure to frighten you. If you haven’t seen the extended trailers–DON’T–cannot say that enough. It’s best to go into this film with only the name and the initial teaser trailer in your mind. Not a spoiler, because it’s well known this this horror film and novel deals with loss, grief, and the uncanny (i.e. the return of the repressed), so the challenge of this adaptation was to force the conflict to derive from those issues and inspire the hellish events for which the story is well known. 2019’s Pet Sematary delivers in spades–quite literally. You will feel the ominous sense of dread from the moment the Creeds move into their new house and that feeling will stay with you as you are buried in a nightmare. This plot is solid. I joined the popular podcast Mike Mike and Oscar to discuss this film, so click below to listen to the show. You are also invited to continue reading my written review. Dr. Louis Creed (Jason Clarke) and his wife, Rachel, relocate from Boston to rural Maine with their two young children. The couple soon discover a mysterious burial ground hidden deep in the woods near their new home. When tragedy strikes, Louis turns to his neighbor Jud Crandall (John Lithgow), setting off a perilous chain reaction that unleashes an unspeakable evil with horrific consequences (IMDb summary). Sometimes dead is better. Let’s address the white ‘el’ephant in the room first. And I don’t mean the major plot twist changed from the novel and 1989 film that we saw in the trailer (c’mon, this is a well-known story and trailer at this point)–I mean the dialogue. Is the dialogue horribly bad? No. But it’s definitely the weak element in the script. Fortunately, this movie makes up for that with incredible windup, excellent deliveries, and the fact it is nightmarishly creepy. The pacing and tone are excellently crafted, and the visuals are fantastic. Never one does this film attempt to prove that it’s better than the original; in fact, it takes what many of us love about the original and use those moments as expertly designed fake-outs and false setups that are followed with something new and fun. So, it acknowledges the original without remaking it. Furthermore, it integrates many elements from the novel and original into the plot seamlessly. Achieving an overwhelming sense of dread from the very beginning of a horror film is quite difficult. That sense of unease is a combination of the atmosphere, setting, and ominous visual elements. Not five minutes into this movie, you are feeling that sense that something is definitely not right about this place. Yes, this is in part because many of us know what is to come; but even for new folks, the evil of this place can be felt all over your body. One of the creepiest scenes features the warped mirror image of an earlier cheerful moment, but it has been affected by the sour soil of the ancient burial ground. While there isn’t much time to develop these characters, the writers were challenged with developing them enough for the story, and it works pretty well. The script isn’t quite as well-written as IT, but the margin of difference is not tremendously wide wither. As much of a fan of the original version as I am, there are areas that this version got better. For instance, the Zelda subplot–much more organically integrated into the main plot of Pet Sematary and even drives the main plot forward by revealing aspects to Rachel’s character. Two things for sure, these are two bad parents and Jud is an irresponsible neighbor. We don’t spend much time in the campus hospital where Luis Creed works, but we still get the big event of the passing of Pascow. Pascow’s character, whereas his harbinger of death or Jacob Marley (as so eloquently put by Mike Mike and Oscar) character isn’t as integral to the plot of this version, he looks more terrifying and doesn’t take a turn for the humorous. Of all the characters, I was most curious about John Lithgow’s performance as Jud. I was cautiously optimistic because Lithgow often has a way of delivering memorable performances, no matter how minor the role. His expression of Jud differs from that of Fred Gwynne’s but he still stays true to the character of Jud. And there are even moments that he channels Gwynne’s interpretation of the infamous neighbor. Just wish he had a Maine accent since he is still a local boy in this village (which is very close to Derry, according to a road sign). One of the best scenes in the movie take place as Lousi and Jud sit around a campfire, drinking, smoking and having an ill–fated heart-to-heart. Contemporary remakes of earlier horror films often rely upon CGI versus practical effects. Cast that worry away because other than a few moments of CG, there are lots of fantastic practical effects from set design to the kills. There is such a high level of authenticity in everything the camera allows us to see, and even those moments that lie just off screen. Yes, there is still the inescapable supernatural factor in this story, but everything else is pretty well grounded in reality. From the parents building a fence to the proximity of the ancient burial ground, everything works to craft an authentic setting and characters. And yes, your Achilles tendon will still hurt in that famous kill. The directors truly seem to take into account that you cannot replace the way real light bounces off real objects and into the camera lens. Out two houses, the characters, and Church the cat exist in the time and space of each and every scene. With the exception a couple scenes that were not necessary or drawn out too far, they all work quite well to setup the following scene and point to the end of the film. There are moments that will cause you to look under beds, under stairs, and even analyze your pet more when you get home. For young audience members, watching this story for the first time, I imagine that they will be terrified just like I was when I saw the 89 one as a kid. While I’ve read reviews claiming that this is the best Stephen Kind page to screen adaptation, I feel that other films have been more effective. Off the top of my head, I’d say that Misery is a better film both in terms of its cinematic critical value and faithfulness to the novel. Not to mention the Oscar-winning performance by Kathy Bates as Annie Wilkes! 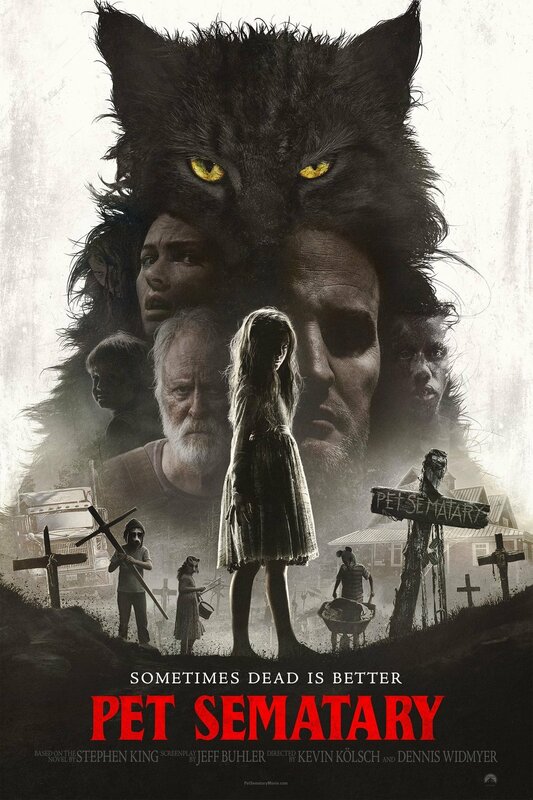 No mistaking it, 2019’s Pet Sematary is a good horror movie and one that has a moderate level of rewatchability. Highly recommend for horror fans! You can catch Ryan most weeks at Studio Movie Grill Tampa, so if you’re in the area, let him know and you can join him at the cinema. Great review Ryan. I agree its a solid movie and I too enjoyed the fake outs of horror tropes in this. The changes would be fine if it did something more with it but it really didn’t add anything to the story for me.